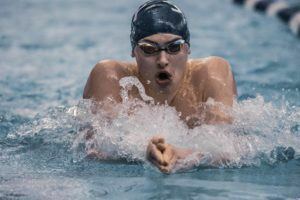 The COMO Invitational at Mizzou has become the premier mid-season contest in Missouri High Schools, giving thirty teams the chance to bring many of the best MSHSAA athletes from all parts of the state together for the first time every season. 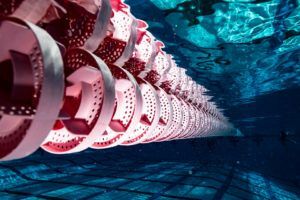 With meet records set in six of the ten preliminary events contested this morning, it was a sure bet that the finals would bring out the best in every athlete and team trying to make their presence felt as the season charges on toward championships in early November. 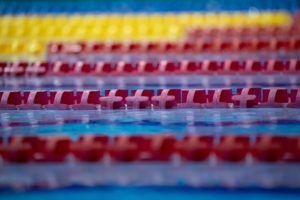 The defending State Champion team, Columbia Rock Bridge, settled for third behind a sprint heavy Blue Springs South and the well-rounded and powerful Tigers from Cape Girardeau Central. 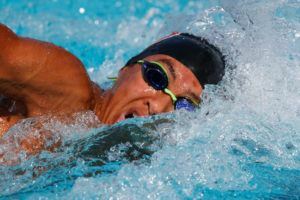 Cape Girardeau Central wasted no time establishing themselves as the team to beat in the prelim of the 200 Medley Relay when the team of Jacob Bening, Sam Hahs, Brogan Davis and Reagan Ragsdale combined for 1:34.15. That time was nearly a full second faster than the State Record posted by their team at the 2015 MSHSAA Championships and made them the first Missouri squad in history to swim under the 1:35 barrier. Unfortunately the MSHSAA does not recognize State Records set anywhere but at the championship meet so the Tigers will need to perform that well again in November to get full credit for their achievement. In the final they fell just short of that time, winning the event in 1:34.78, followed by Rockbridge nearly three seconds behind at 1:37.74 and Kearney at 1:38.89. In the 200 yard freestyle, another meet record was set in the prelim when Cape Central’s Brogan Davis, fresh out of the winning medley relay, touched at 1:42.08. In the final though, the 2015 MSHSAA State Champion in the event, Lee’s Summit North’s Liam Bresette, managed to hang just a hair behind Davis until the 150 yard mark where he turned up the tempo and took control. Bresette, the only competitor in the A final wearing a brief, came home in 24.50 to reset the record to 1:40.60. Davis improved upon his preliminary swim with 1:41.29, followed by Zach Lorson from Rockbridge at 1:43.87 for third. 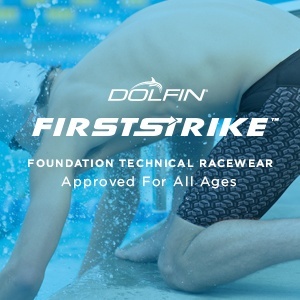 The 200 IM Meet Record was set twice on the day as well, this time when Sam Drew from Lee’s Summit dropped a 1:53.51 in the prelim, and then again when Drew was pushed to 1:52.57 by Dane Florea from Rockbridge who hung with him stroke for stroke to touch at 1:52.70. 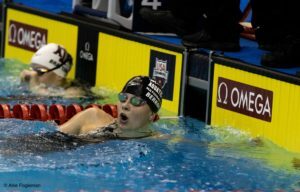 Sam Hahs from Cape Girardeau Central managed to stay with the leaders through the backstroke but settled for third place at 1:58.48. Eureka High School’s Mason Jung set the Meet Record for the 50 freestyle in the prelim to a 21.24, but the mark traded hands in the final when Cape Central’s Reagan Ragsdale touched well ahead of the field at 21.10. Jung was the runner up at 21.52, just holding off Noah Witzki from Liberty who finished in 21.55. 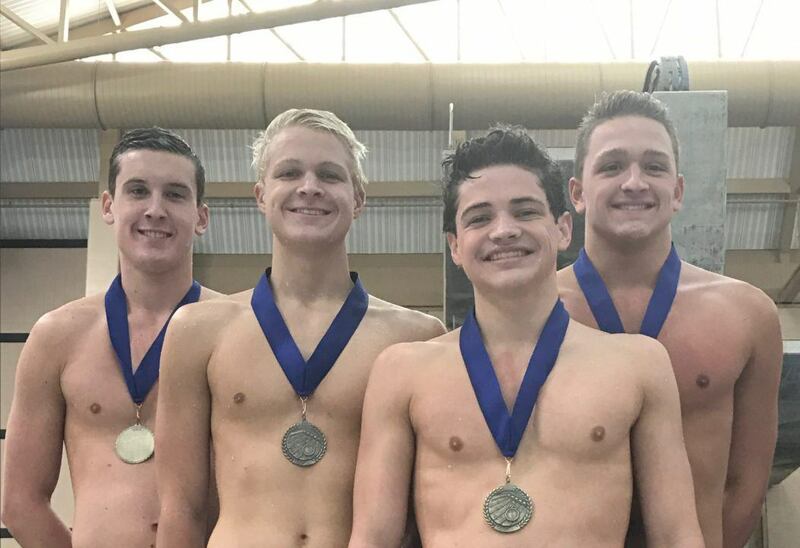 One-Meter Diving saw three finishers above 400 points with Hunter Grannum from MICDS taking the COMO title at 461.20, along with Daniel Valmassei from Lee’s Summit North (431.85) and Alex Burt from Blue Springs South (412.55) who rounded out the top three. Last year’s MSHSAA runner up in the 100 fly, Cape Central’s Brogan Davis, managed to lower his 2015 Meet Record in the final to 49.90. Davis was actually behind at the 50 when Liberty’s Noah Witzki turned at 23.57 to Davis’ 23.77, but Davis blasted a 26.13 split for the second half that sent a clear message to the rest of the state that he wants the event to be his this year. Witzki finished in 51.23, followed by Ben Morgan from Blue Springs South who touched at 52.53. Reagan Ragsdale put the Cape Central stamp on another Meet Record when he crushed the old mark in the 100 Freestyle by .63, finishing at 46.19 for another Tiger win. No other competitor in the meet was below 48 seconds, with the nearest being Kearney’s Austin Wolfe (48.15) and Hazelwood West’s Spencer Campbell (48.21) finishing second and third. 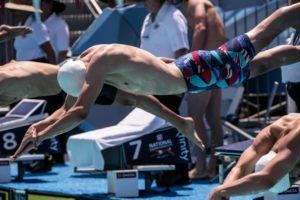 The 500 freestyle showcased three outstanding distance talents racing stroke for stroke beyond the 400 yard mark. Once again the only athlete in a brief, Liam Bresette made it look like he was just playing with the rest of the pack when he split 25.08 over the last 50 to crush the Meet Record with 4:32.84. Dane Florea from Rockbridge managed to sneak past Kearney’s Evan Holt for second, finishing in 4:35.84 to Holt’s 4:35.91. Blue Springs South had broken the 200 Freestyle Relay Meet Record in the prelim, but came back in the final to drop another 1.3 seconds from the mark in dominating fashion. The team of Nick Keller, Kyle Hepting, Ben Morgan and Jake Workman combined for a 1:27.10 finish. That time would have bested the 2015 MSHSAA Champion in the event by over half a second, and puts a large target on the team as they head into the final meet. Liberty North and Rock Bridge finished in 1:29.73 and 1:31.28 respectively for second and third. 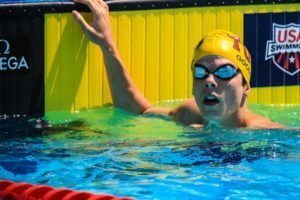 Cape Central freshman Jacob Bening, the top seed in the final of the 100 Backstroke managed to hold on to the top spot by a fingernail, out-touching Michael Franz from DeSmet 52.00 to 52.06. Ben Morgan from Blue Springs South was right with them as well, finishing in 52.50 for third. Sam Drew took another win and his second Meet Record of the night with his 57.10 over the 100 Breaststroke. Three more swimmers finished below 59 seconds behind him, with Cape Central’s Sam Hahs (58.04,) Kearney’s Spencer Steward (58.58,) and Rock Bridge’s Caleb Rhodenbaugh (58.82) taking second, third and fourth in that order. The 400 Freestyle Relay was the tenth Meet Record to be set in the final, when once again Cape Central’s team of Bening, Truman Vines, Davis and Ragsdale combined to cut over three seconds from the mark set last year with a stellar 3:11.49. That swim won the event by over three seconds beyond Rock Bridge’s 3:13.98 and Kearney’s 3:15.37, while also sealing the team title for the Tigers in spectacular fashion. The MSHSAA State Championship will be at the St. Peters Rec Plex, in St. Peters , Missouri on November 4th and 5th.